How do you create a home in 4.5m? It’s tricky, but a lot of fun. A family of four had lived in this modest, ageing house for almost eight years. As the children neared their teenage years something had to be done. Abandoning their home and moving elsewhere was not an option as the family was an important part of a thriving community. Within this pocket of Fitzroy is a dense mix of workers’ cottages and small terraces. All are modest in size, many are dark and cold. Many of the cottages and terraces are in original condition, with a simple facade hiding an assemblage of brick and weatherboard lean-tos in the rear yard looking onto bluestone laneways. These lean-tos create a mesh of detailed and varying volumes, in stark contrast to the simplicity of the street front. When building in the rear of a property in this context, facing onto the laneway, one is acutely aware of the smallness and texture of the existing built form. Within this context the burden is on the designer is to respond to the assemblage of small volumes while also maximising the potentials of the owners’ brief. As Fitzroy has gentrified we have seen renewal take place in unsympathetic ways. There are numerous examples of this assemblage of dark brick and weatherboard being replaced with large contemporary objects that dominate its context. The tactic at Moor Street was to maximise the interior functions and available space, while also responding to the context by creating a single building out of three small objects rather than a single contemporary monolith. The tired lean-to which housed the kitchen, bathroom, dining and laundry were removed. These functions were relocated and updated along with the addition of a master bedroom over. The original brick terrace was retained, tidied and brought back to life. In the centre of the original house was a small light well containing a beautiful, yet constrained, Japanese maple tree. The family often found themselves conversing through this lightwell. Conversations took place, through the maple, from upstairs bedroom to kitchen opposite, to study space and even the bathroom. The maple was retained and the lightwell expanded and surrounded in glass, bringing the tree into the living spaces. The conversations between spaces and levels, through the maple, are better and easier than ever. The separate boxes on the upper level contain the master bedroom. This space is surrounded by the canopy of the maple to the south and the canopy of a large gum tree to the north, making the master bedroom feel much like a treehouse. 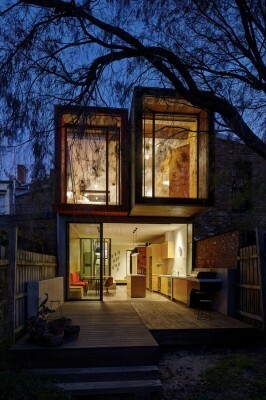 Through the gum’s canopy are views over Fitzroy, revealing the detailed assemblage of the brick and weatherboard lean-tos of the surrounding workers’ cottages and small terraces.